Topology hidden inside materials in the matter group called cerium monopnictides has been determined for the first time in the world. The topological electronic phase distinguished by the latent topology inside materials is the award-winning subject of the Nobel Prize in Physics 2016, research on which is now being actively conducted all over the world. In the topological electronic phase, an electronic state peculiar to the topological electronic phase occurs at the surface of materials (appearance), reflecting topology hidden inside materials (substances). For this reason, topology of a substance has been judged only by its appearance. 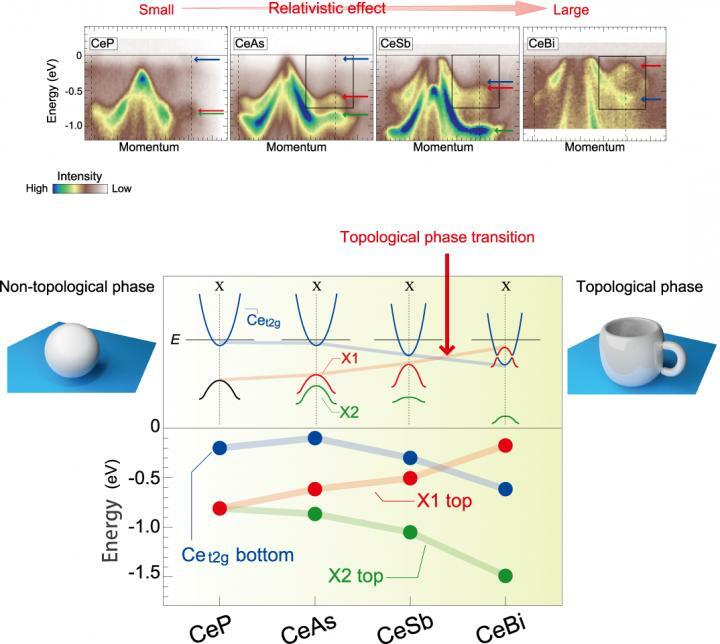 A joint research group succeeded in observing the topological phase transition in which a material changes to the topological electronic phase by using soft X-rays, light suitable for determining the topology of materials by their substances rather than by their appearance. Since this research achievement enables direct determination of the essential topology hidden inside materials without judging the surface of the materials, it is expected that employing this technique will lead to the discovery of more diverse topological electronic phases. This result was achieved by the research group of Assistant Professor Kenta Kuroda and Associate Professor Takeshi Kondo of the Institute for Solid State Physics, the University of Tokyo (Director Masashi Takigawa), in collaboration with Team Leader Ryotaro Arita (RIKEN Center for Emergent Matter Science), Assistant Professor Masayuki Ochi (the Graduate School of Science, Osaka University), Senior Scientist Takayuki Muro (Japan Synchrotron Radiation Research Institute), Deputy Director-General Hideyuki Kitazawa (National Institute for Materials Science) and Principle Researcher Yoshinori Haga (Japan Atomic Energy Agency).